My thoughts and prayers are with Whitney and Troy today as they are experiencing something that I simply cannot imagine. Whitney, your courage has been an inspiration to me. My heart is aching for you all. Payton has her daddy wrapped around her little finger. Can you tell? Well, it sounds like Payton will start receiving her OT soon. This is the therapy she is in most need of so I'm very excited about this. It'll be another home visit, but not too much longer and she'll start receiving her therapy at school again (in the fall). 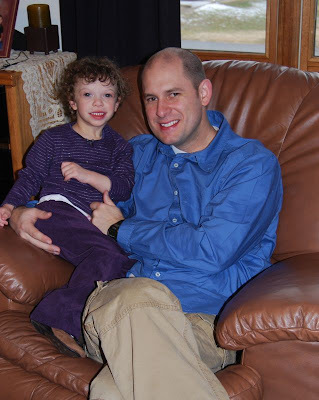 This past weekend we went to West Plains to see Bob's family. The trip is only about three hours - not bad at all. However, it's amazing what a trip like that can do to Payton. I'm happy to say that we can now almost 'read' Payton as to when things are beginning to get a bit much for her and we either take her to another room by herself or take her outside where things are calmer. It was Bob's mom's 60th birthday and we were attending her suprise party at a restaurant. I was so proud of Payton - she did so well. And, when we could see that Payton was getting overwhelmed Bob would take her outside for a bit. Eventually we just took her outside and then went ahead and went on back to the house. I feel for Payton - she takes so much in and then eventually it's all got to come back out. Around nine o'clock that night she let loose for about an hour or so and just screamed and cried until she was able to get it all out of her system. Bob's mom ofcourse felt bad and said she hated that coming to her house does this to her. I told Wanda not to think a thing about it - it happens everywhere she goes, it's just usually we are able to take her home to where she can regroup herself and be in her usual surroundings. The next morning we tried taking her to church, but it was so loud she couldn't handle the noise. She kept saying "hurt my ears" so I just took her back to the house again. Communication is great - I used to wonder why she'd scream and never make it thru a service. Now I know why....and once we leave she is just fine. On the way home, Payton screamed and cried for about two and half hours of the trip....once again needing to get all the emotions out from the weekend. That makes a car ride extremely stressful. Bob and I realized why we hadn't made that trip in a while! It's so tough on Payton - she really has to come home and be 'de-sensitized'. It's strange - it's not while we're there that the meltdowns begin, it's usually when everyone has left or when things settle down that she lets her guard down and just lets it all go. Payton spent most of her evening on a huge emotional roller coaster ride - and it usually takes her about a week to settle back in, so I'm hoping by the weekend she'll be back to herself. Bob and I just sat there on the sofa last night in a daze.....it's tough seeing your child unable to handle changes in routine.....I'm very hopeful as she gets older traveling will be so much easier. (Koen's got to be hoping that too!!). And-I'm extremely thankful that my mom gives me a shoulder to cry on when Bob and I feel emotionally exhausted as well. I once again felt my heart drop into my stomach when checking everyone's blogs last night. 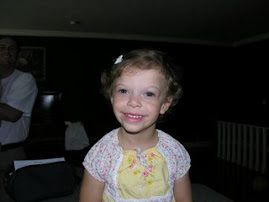 I was devastated to see that Michaela's MRI had shown a brain tumor. I wish we all lived close so we could be there for each other in person. Please continue to keep Abi, Ava Jewel, Ava, Blake, and Michaela in your prayers. It's been a tough week. I think sometimes I let all the thoughts of having a special needs child consume me and it's hard to focus on anything else. 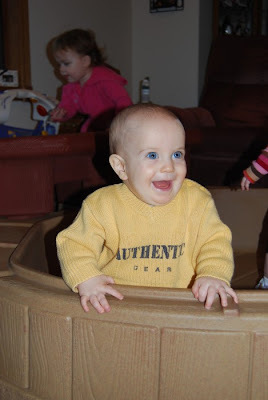 I'm not sure if having Koen still makes me mourn everything Payton has gone thru - and will go thru - or if it's just a process I would go thru whether I'd had a typical child or not. 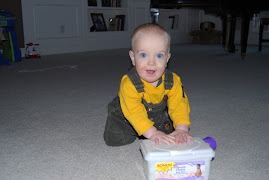 But, seeing Koen healthy and happy and able to be calmed makes it tough when I look back at Payton's first few years. 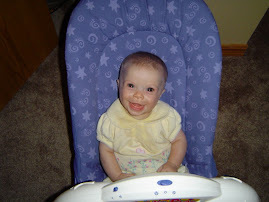 Blogging is an outlet for me and I wish I had started blogging as soon as Payton was born. I think it would've helped some of our family and friends realize what was going on in our lives and maybe help them to understand why we are still trying to recuperate from everything that went on those first few years. All I know is that williams syndrome changed my life in ways I never thought and has left a hole in my heart that I don't think will ever be filled. Someone I love will need unconditional love and support after I am gone-this frightens me to the core. Someone I love has taught me about love and about the really important things in life. . . . Please keep Ava, Abi, Blake, and Ava Jewel in your prayers. Surgeries and illness have been taking a toll on these families and they sure could use the extra prayers. 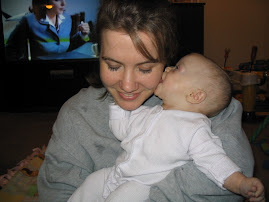 There were always the things I couldn't wait to hear, such as "mama" and "I love you" from Payton. And, after waiting so long, it took a while before tears no longer came to my eyes when I would hear those words. Ofcourse there are still things I ache for her to be able to tell me. For instance, when she is sick I would love for her to be able to tell me exactly what hurts or when she is hungry I would love for her to tell me instead of all of a sudden going into a huge meltdown and meanwhile I'm trying to figure out exactly what is the matter (is it sensory, is she hungry, is she cold). But, I know this will eventually happen....it just hasn't happened yet. This weekend I felt like we hit a major milestone. 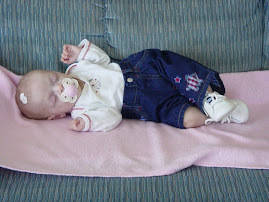 I was trying to get Payton dressed for children's choir and had grabbed a pair of blue jeans. As I was trying to slip them on Payton's leg she said "I don't like jeans! They hurt!". 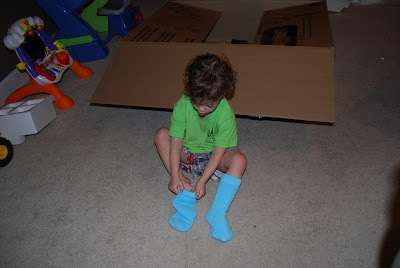 I don't know why, but I questioned it and tried again to put them on her. Sure enough, she said it again. "It hurts!" It feels so good to know that she is simply not comfortable in jeans. I remember when her first OT was working with her and she told me that everyone has something that 'irritates' them. For myself, I immediately thought of a cotton ball. Just holding a cotton ball in my hand is 'uncomfortable' to me - strange, I know, but it is. It just gives me the willies. 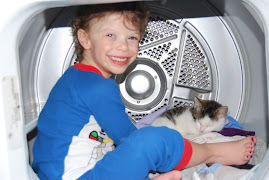 The OT told me that we all have things that bother us, but the children she works with are not really even comfortable in their own skin and she helps them become comfortable. 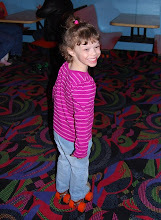 Yesterday when Payton told me the jeans hurt her, I thought back about the conversation I'd had with the OT (and thought about how abrasive a cotton ball can feel to me). I'm so thankful she is able to express to me that jeans are not comfortable to her......another milestone under our belt! When I was younger I loved winter. Now that I have children I'm ready for it to be warm so we can all get out there and burn off some energy. Come on Spring! The past two days I stayed home with the kids. Koen has a double ear infection (started antibiotics Saturday but it wasn't working so we switched to a new one today) and he was finally diagnosed with asthma. 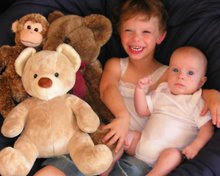 He's a little wheezer - has been since he was born - so it was nice to finally hear them say - yep, it's asthma. 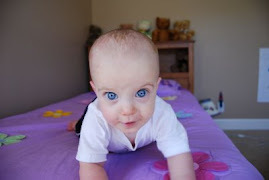 And hopefully in a month or so he can get some tubes in his ears to keep those little infections at bay. And - Koen signed 'more' for the first time today! It's funny how the first time you see your child sign you about fall over. You try and try and try to teach it to them thinking they aren't ever going to do it - then all of a sudden, bam, he signs. Payton didn't sign until she was about 18 months or so (I waited until she clapped and then thought she could probably do it) and I did the same with Koen - once he started clapping I tried signing with him. Today, he did it! Oops, spoke too soon. Payton was in the other room asleep and I heard her call out for me. I went in there and she said "no more clocky". I said "Remember, daddy took it outside so we don't have to worry about it." She sat up and said "I LUB (love) clocks!" with a huge grin. She does this when she's trying to talk herself into liking it. I swear, I love that little girl to pieces. 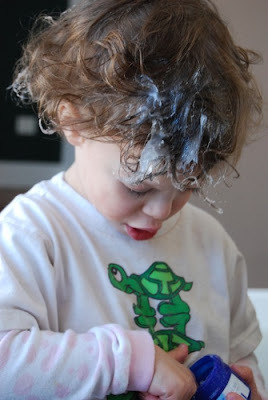 I tried washing it a couple of times and it still looked greasy greasy but we were heading to my niece's first birthday party so I thought I'd see if anyone had any suggestions on how to get all the Vicks out of her hair. Both of my sisters married farmers so they had tons of ideas. 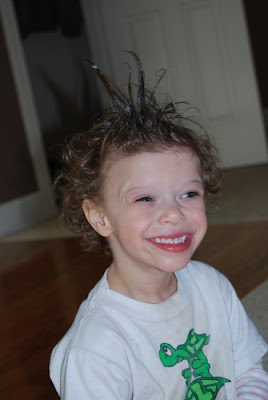 Shawna put cornstarch in her hair (I'm not sure why, but they use this on cattle....so they tried to see if it would work on Payton - and it did look a lot better! My mom also suggested using Dawn, so we washed her hair with that and it seemed to help too). 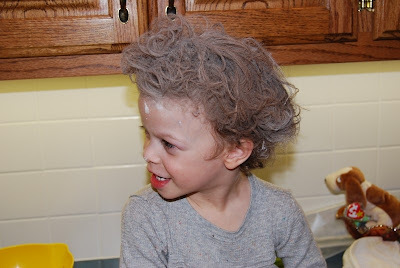 Here's Payton with the cornstarch in her hair - when my 2yr old niece Laney saw her she told Payton she looked BEAUTIFUL! Payton had a ball with this....although she is still a little 'greasy' looking. 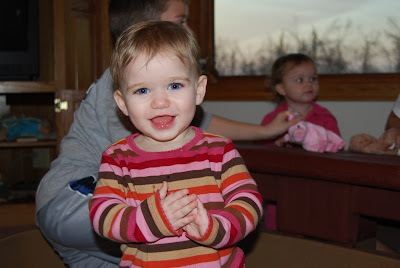 This is my niece, Ellie, who had her 1st birthday party Saturday evening. She is such a doll and so much fun. I think that was actually the first birthday party she and Koen both had been to - and as you can see, they seemed to enjoy themselves. 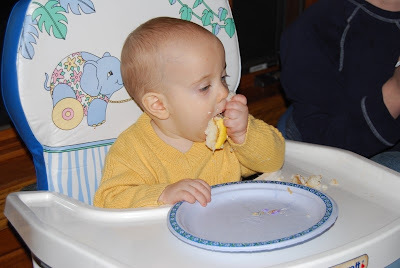 I don't have any pics of Ellie diving into her cake - she didn't care for it too much-but here's Koen smashing it into his mouth. He, ofcourse, loved it. 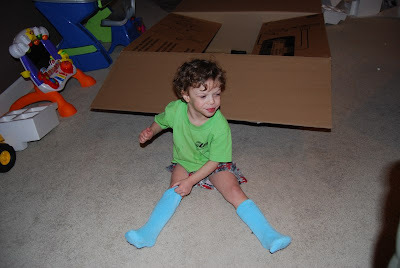 One thing I enjoy about blogging is hearing input from other moms of children with ws. They give me very good advice and I also realize how similar these children are to each other. 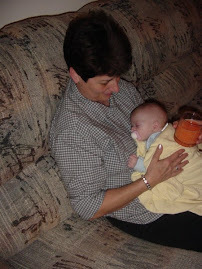 This morning I was reading Nancy's blog about her son, Erik and my heart just ached for her. I immediately called Bob and told him he needed to read Nancy's blog because he just wouldn't believe the similarities. Last night seemed to be about the same as the rest of the week. My father called and asked if we'd like to come out to dinner and I thought it would be a nice change for Payton - she could see a couple of her cousins and get to play with them a bit. My mom was aware of the week we had thus far and was hopeful being in a different place would help her have a better evening. Unfortunately she seemed to wreck havoc on everyone at her grandma's house as well. It really is hard not to feel sorry for her. She threw things, hit basically everyone there (if you walked by her or if she walked by you, you were apt to get swung at), and threw her fits. Then, as usual, wet her pants. Looking at her, I see a child frustrated and anxious. Anymore, I come to work and sit and worry about how she's doing. If I wasn't the one who carried the insurance I would quit my job and stay at home. The guilt I feel for not doing it is almost unbearable - but the fact is, with all medical problems associated with ws we have to have insurance for her or we'd be flat broke. For any of my family and friends interested in reading Nancy's post, just click here. Thank you, Nancy, for being so open and honest in your post.